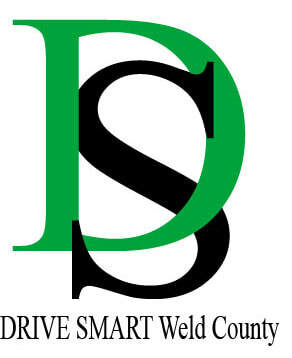 For more than 20 years the DRIVE SMART Weld County coalition has been working to keep Weld County teen drivers and passengers safe. 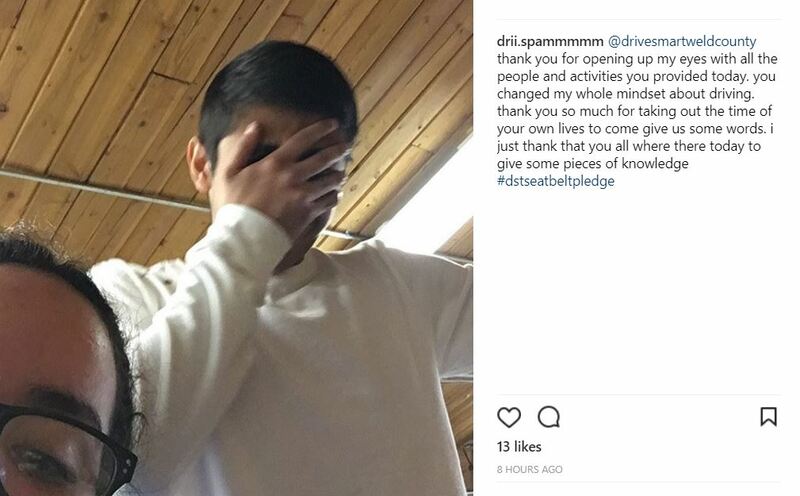 DRIVE SMART started the teen program in February 2001. 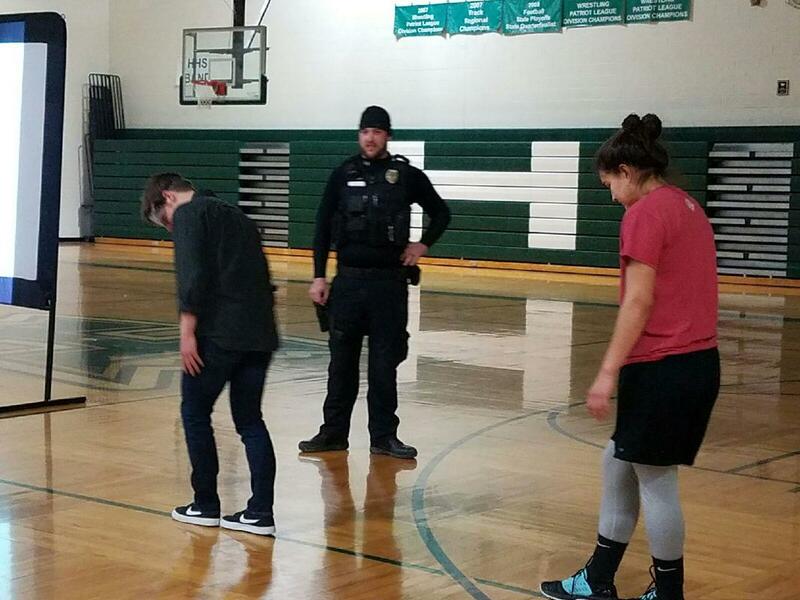 The two hour in school program engages students with law enforcement officers, survivors, scenarios, videos and games. All are designed to help teens make wise choices when behind the wheel. Pre and post surveys are a part of the program and allow the coalition to keep the program viable and relevant as well as sharing valuable information with the schools. 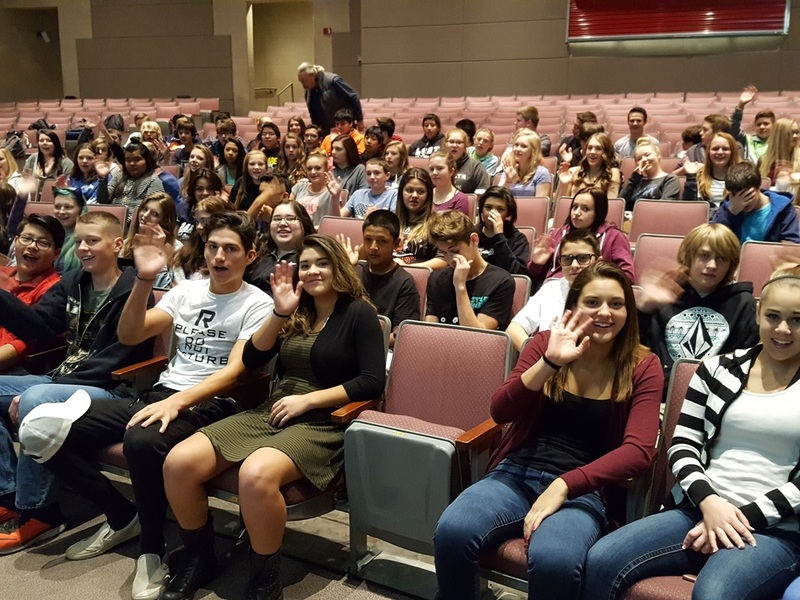 During the 2017/2018 school year, programs were presented to approximately 1,100 students at 12 Weld County high schools. Thanks to Frontier High School for sponsoring our DST program and to Platteville PD for loaning us Officer McChesney to teach students about making wise choices behind the wheel. Ron Waterman, Eaton PD, Banner Paramedics, Helfrich Allstate Insurance all partnered to present the DST program at Eaton High School. We had our first DRIVE SMART Teen program of the spring semester this morning at Roosevelt High in Johnstown. Many thanks to our team of partners for making this program a success. We had the big rig from Walmart to help educate students and staff about safe driving around big rigs, banner paramedics, Johnstown Police, Allstate agent Sue Helfrich , Colorado Motor Carriers Association, professional driver and teacher Scott Murray, and survivor Marva Wilcox. All teamed up to help teens make wise choices behind the wheel. 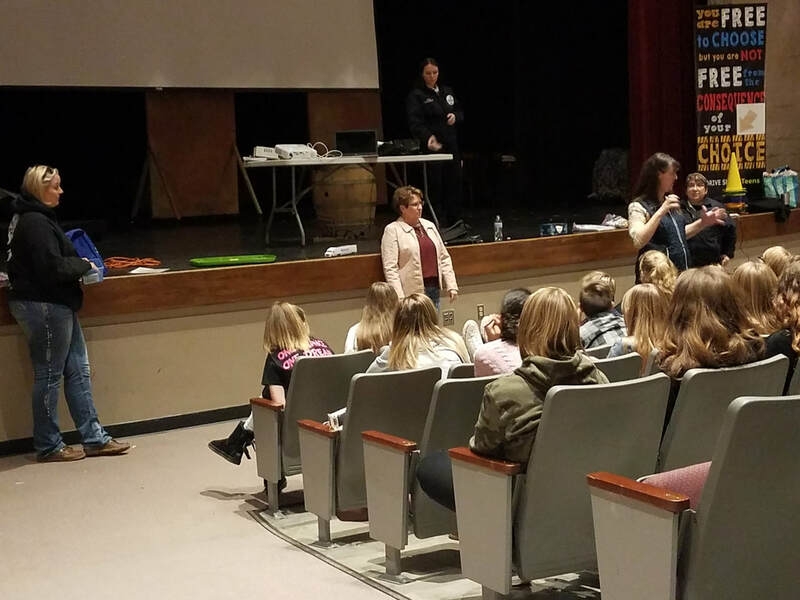 Platte Valley High school hosted the DST program with 84 freshman participating. 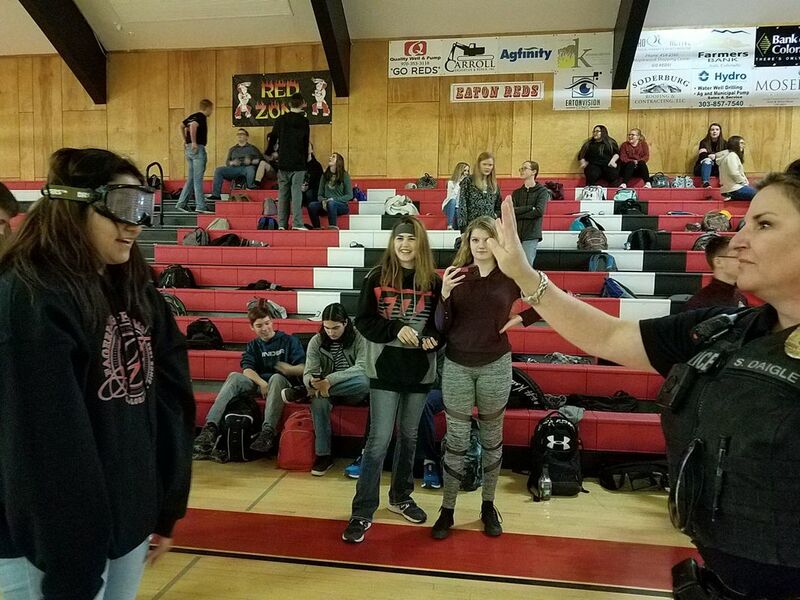 Kersey Police Chief Gottschaulk put students through the roadside sobriety tests while wearing the fatal vision goggles and addressed making wise choices behind the wheel. Sue Helfrich from Helfrich Allstate Insurance talked to students about how poor choices affect insurance rates. We had an good morning with students at Roosevelt High! A full program of survivor speakers, trauma, law enforcement, driving safely around big rigs, and insurance filled the morning with inspiring, touching and educational moments with some fun and games thrown in. Thanks to Roosevelt High for having us! 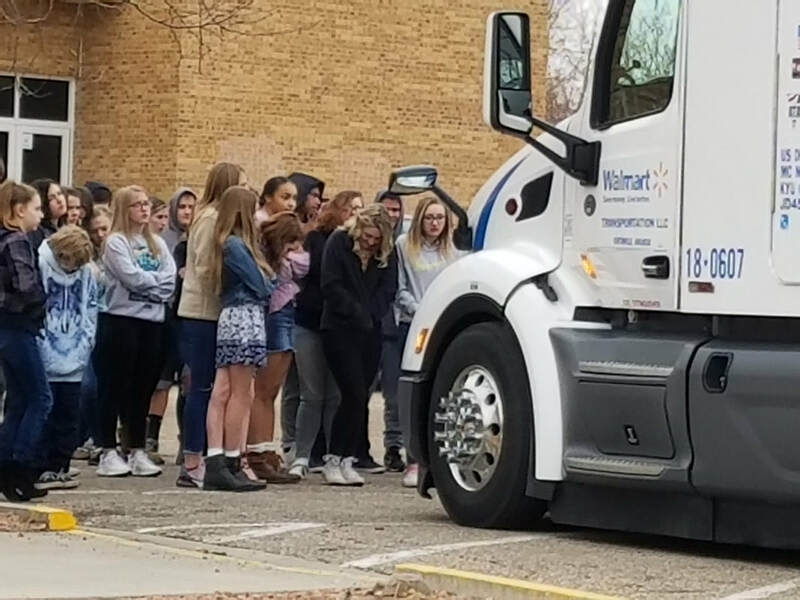 The DRIVE SMART Teen program brought out the big rig during the Truck Smart part of the program at Weld Central High School. 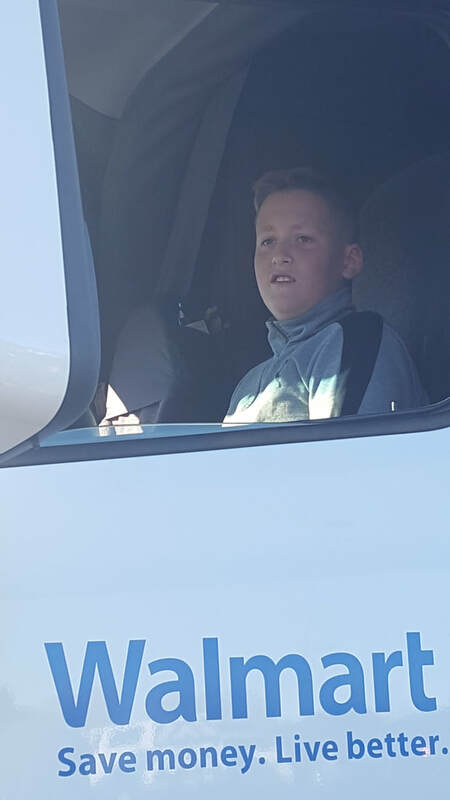 Students were able to listen to a driver talk about how to drive around a big rig and then were able to get in the cab and experience for themselves the blind spots or No Zones. Many thanks to our partners at Walmart and Colorado Motor Carriers Association. We presented to a great group of Valley High School students. Officer Matt McChesney did a great job of talking to students about GDL, distracted and impaired driving and seat belts. We caught a short video of students attempting to break apart a seat belt during a tug-o-war. The team has begun the programs for this year! 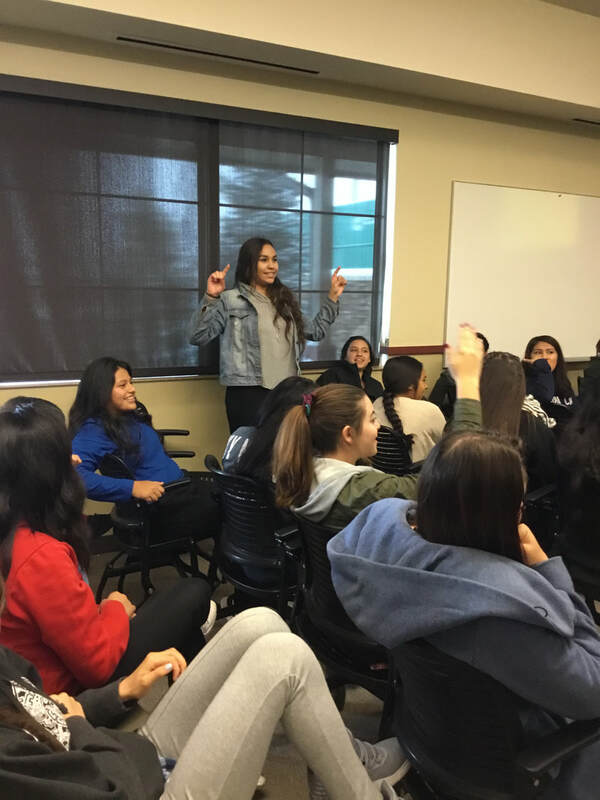 Our first program was hosted by Northridge High with 350 students in attendance. Officer Zander from Greeley PD puts student volunteers through some roadside sobriety tests while wearing the fatal vision goggles. The DRIVE SMART Teen program was at Eaton High School with a good group of students. Thank you to Eaton PD for stepping in to speak! Survivor speaker Jordin Martinez shares his experience. The fatal vision goggles are always an experience. Good day with the students of Scott Leffler's class at Valley High. Thanks to Platteville PD, Jordin Martinez, Sarah Kos/CMCA, Stacey Chase/Banner and all the other volunteers who made this day possible! Students play tug-o-war to see if they can get a seat belt to separate. 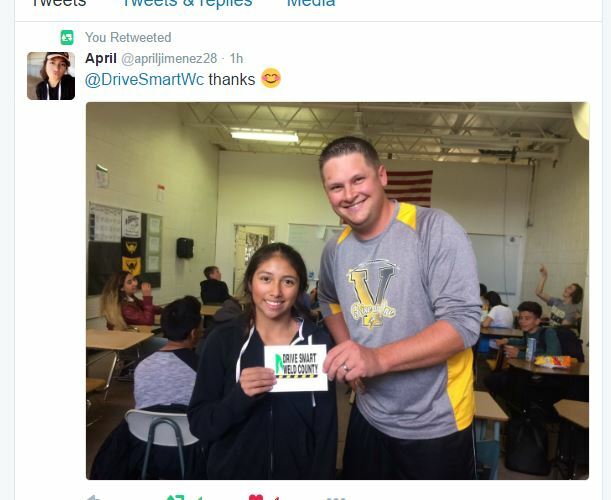 Roosevelt coach Wasinger presents student Adriana Trujillo a $25 gift card from the DRIVE SMART Teen program for her winning instagram post. Faith Stephens had the winning safety pledge and received a $25 gift card. 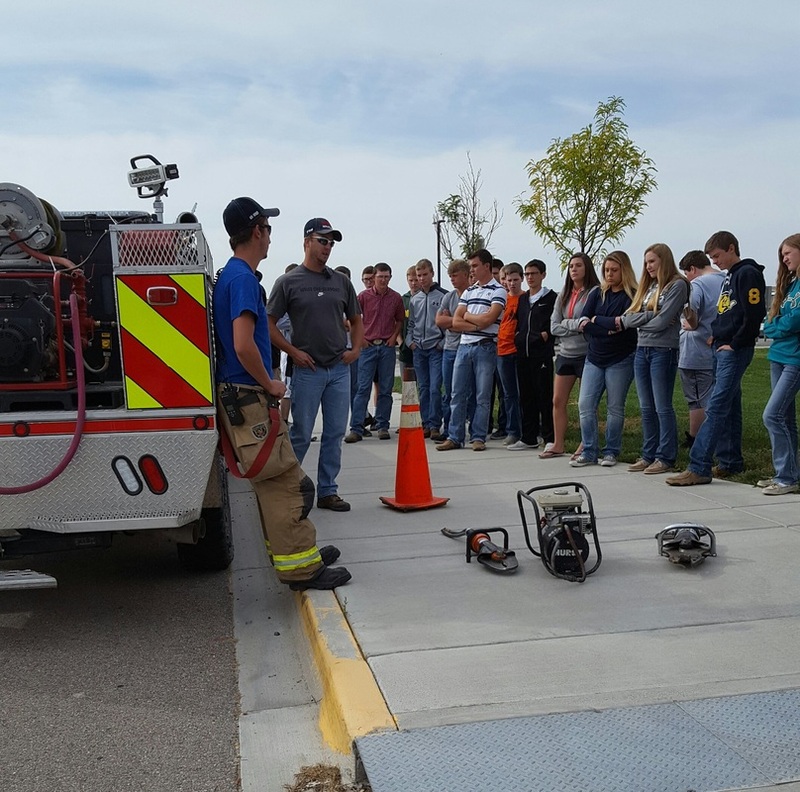 Thanks to Kersey Fire Department for letting us use their facilities to host the Platte Valley DRIVE SMART Teen program to the freshman. Officer Thienes of Kersey PD did an awesome job presenting the Law Enforcement piece! Officer Thienes, Kersey PD, explains the walk and turn maneuver to a student. Cassidy Reed was the winner of a $25 gift card for her safety pledge tweet. 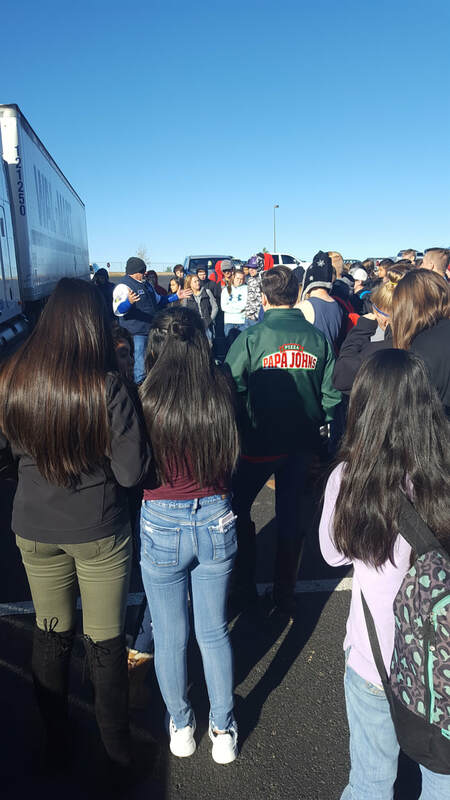 A student explains the No Zone after listening to big rig driver Scott Murray speak. Program facilitator and Banner Paramedic Stacey Chase watches as Scott Murray, professional driver, interacts with students. Roosevelt hosted the DRIVE SMART Teen program to a great freshman class. Lots of good questions and interaction. Thanks for having us! 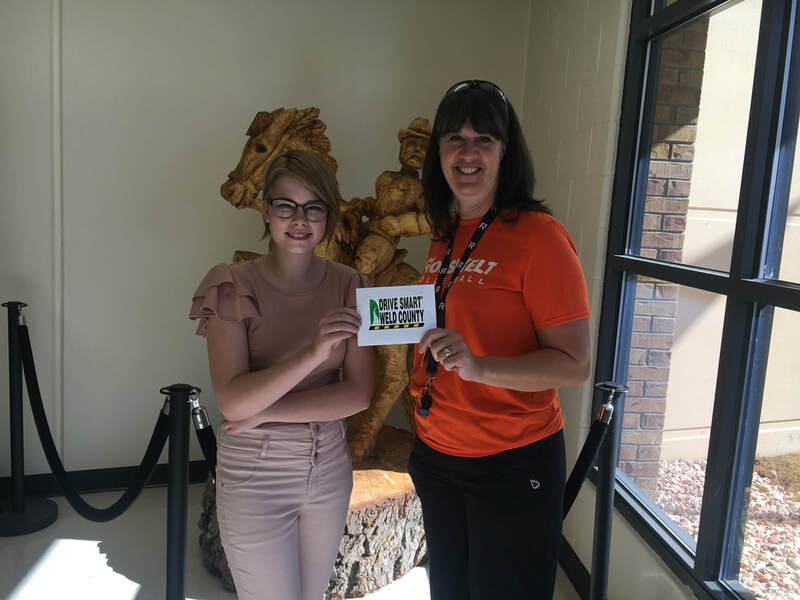 Roosevelt teacher Robin Wells presents Macey Parrott a $25 gift card from DRIVE SMART Weld County for her winning social media pledge. 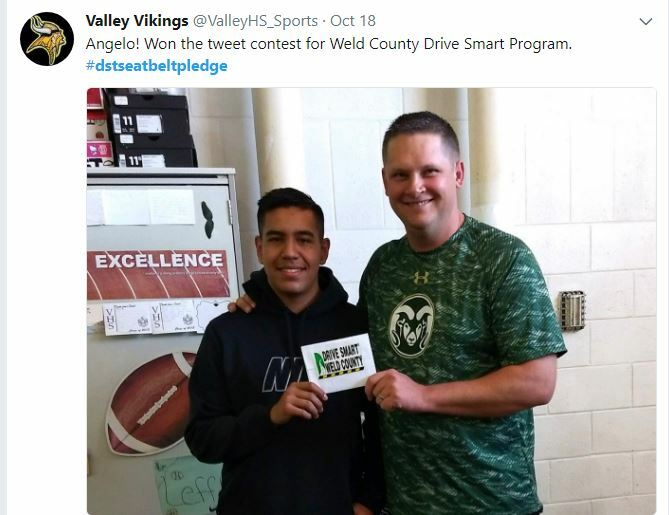 Angelo Gonzalez had the winning #dstseatbeltpledge from the Valley High DRIVE SMART Teen program. It was a good afternoon with students and sponsoring teacher Scott and Officer Matt McChesney from Platteville PD. 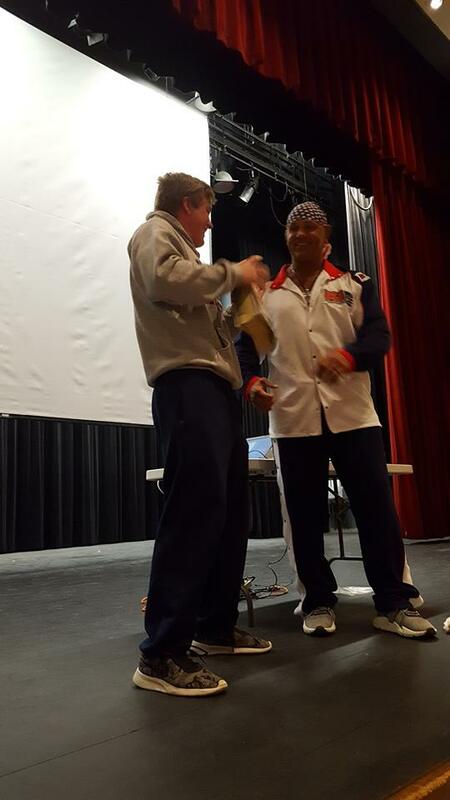 One of the football players attempts a feat of strength with survivor speaker Ron Waterman. Northridge High kicked off the start to our 2017/2018 DRIVE SMART Teen programs. A great group of kids with speakers Ron Waterman, Officer Colby Zander, and Banner Paramedic and EMTs Stacey Chase and Jaylie Ross. 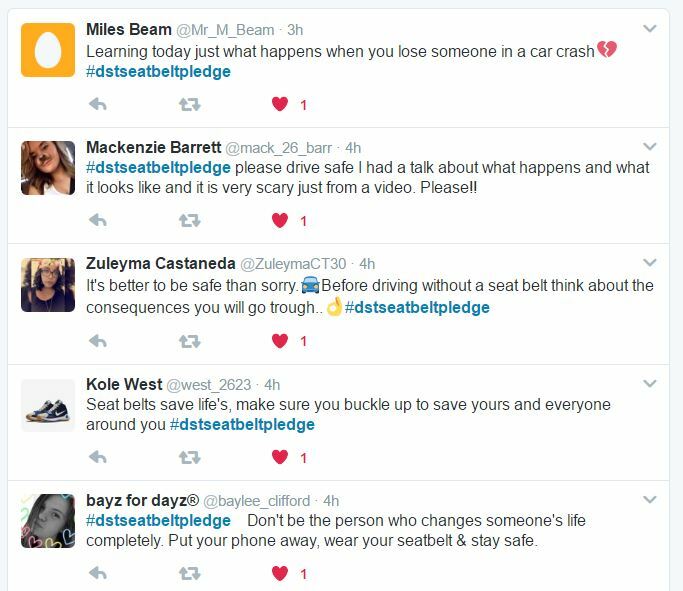 Dylan Mauro was the winner of the $25 gift card for the best seat belt pledge tweet. Many thanks to the Allstate Foundation, State Farm and CDOT for funding for these programs! 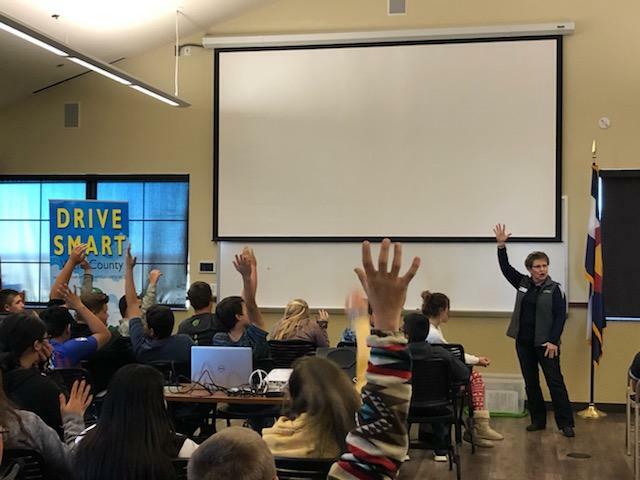 Two seniors working on a safe driving project hosted a DRIVE SMART Teen program at Union Colony Prep school. The students and staff were awesome to work with. Thanks Garrett and Mathew for the work you are doing to keep Weld County residents safe on our roadways! Playing catch with fatal vision goggles on can be pretty tricky! What a day with the awesome students at Platte Valley High! Many thanks to our wonderful presenters: Banner Health, Kersey Police Dept., Colorado State Patrol, Colorado Finders, Helfrich Allstate Insurance and Lori Stutts. They make our programming possible. The winning tweet of the day. Banner Paramedic Stacey Chase gets her point across how a pelvis can be crushed by an improperly worn seat belt. Sue Helfrich makes even insurance exciting! 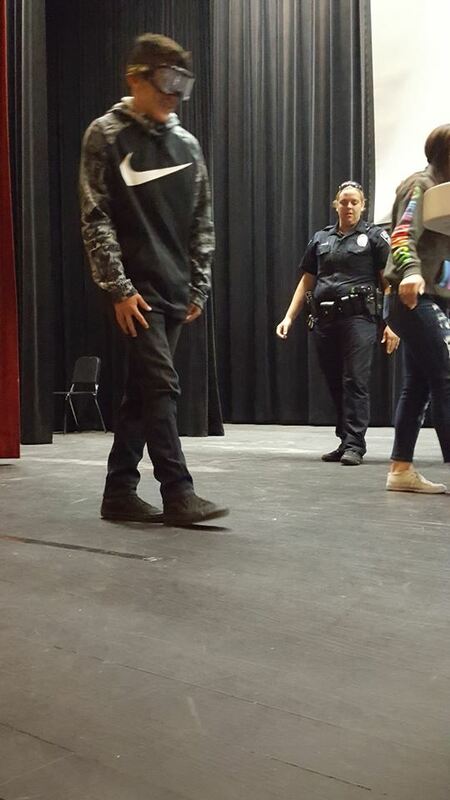 DRIVE SMART Teen interacted with 148 enthusiastic students at Eaton High School. Thanks for making our day! 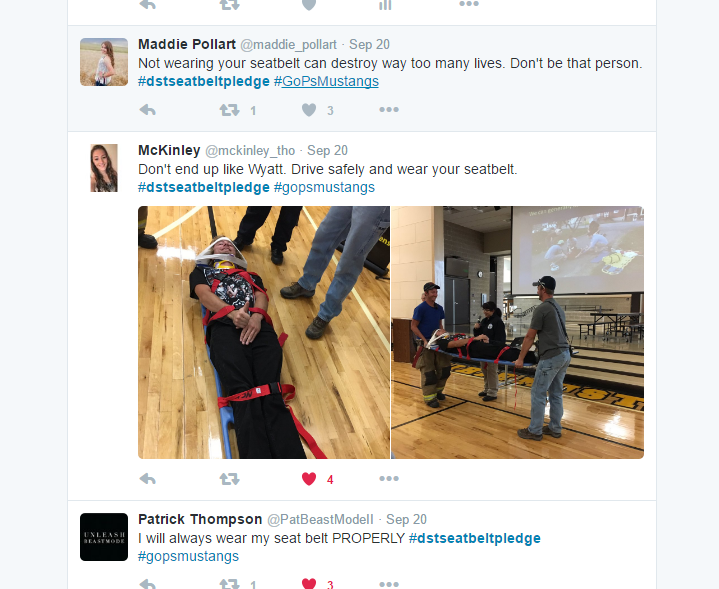 The winning safety pledge tweet from the day. Eaton PD put students through roadside sobriety paces. Speaker Ron Waterman demonstrated feats of strength and then talked about the importance of wise choices. Thanks to Valley High and Scott Leffler for hosting the program yesterday. The students and speakers were awesome! The winning tweet from Highland High school. 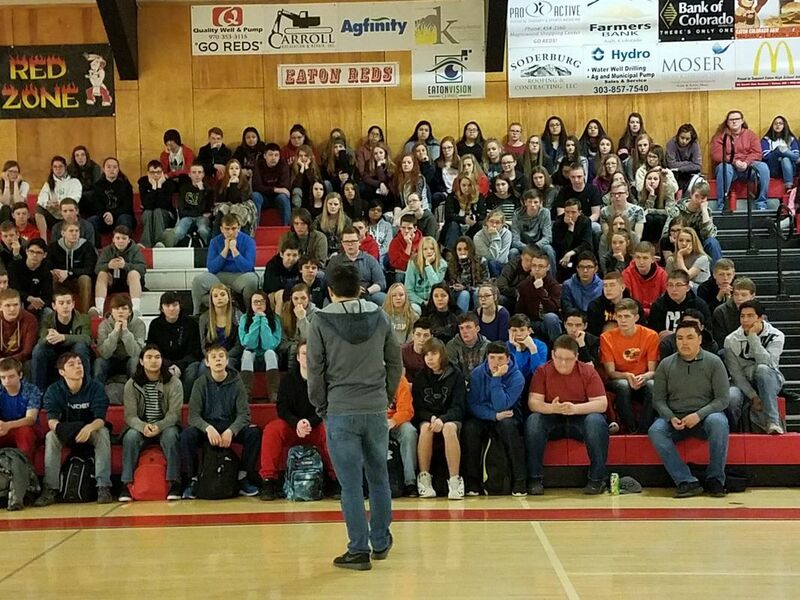 Thanks to teacher Zach Sandstrom for sponsoring the DRIVE SMART Teen program at Highland again this year. It was a fun interactive day with students, Ault Pd, survivors, and staff. 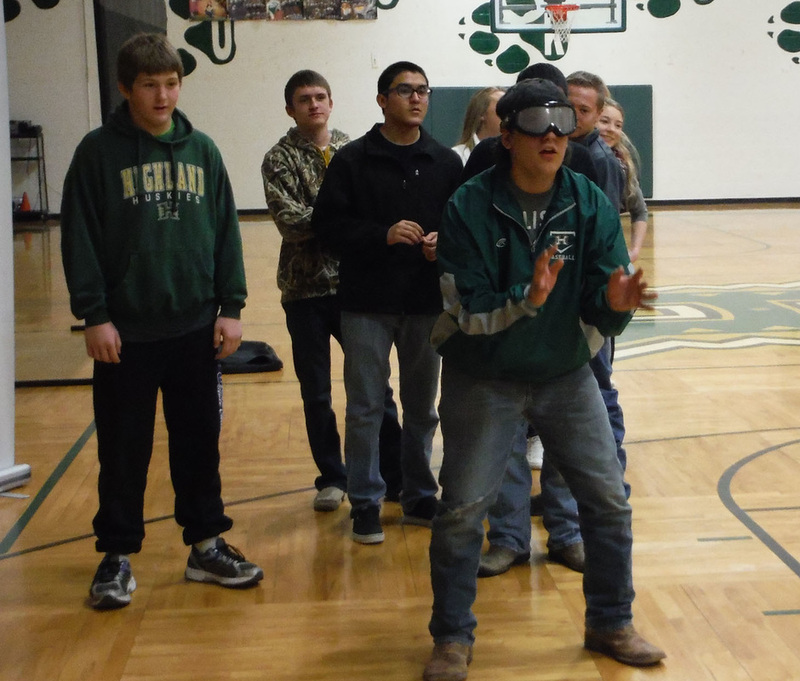 Ault PD makes students walk the line with Fatal Vision goggles. 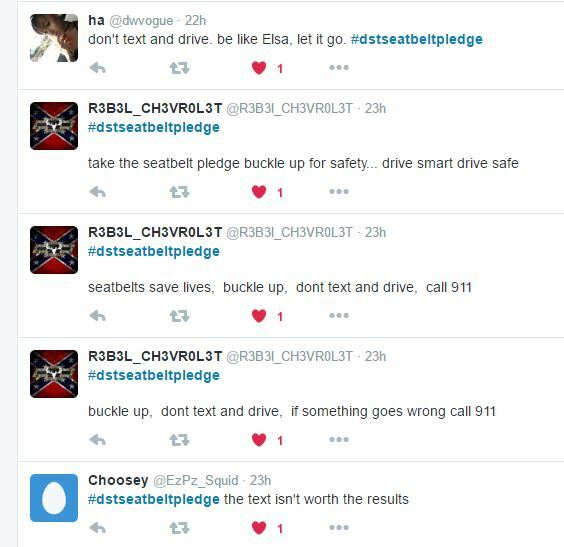 Some of the Seatbelt Pledge tweets from the Roosevelt High School DRIVE SMART Teen program. Once again there were so many good tweets we had to draw names to get a winner. Kole West was the winner of a $25 gift card for the tweets he made. A happy "Good Morning!" from the students at Roosevelt High! Survivors Luis Cerenil and Marva Wilcox made a lasting impression and Johnstown Officer Rod Brown dished the latest on GDL, distracted driving, and DUIs. 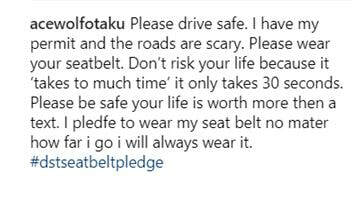 Kersten Rogers was the winner of the Twitter seat belt pledge. Thanks to Valley High and teacher Scott Leffler for sponsoring a super program! Officer Lago did a fantastic job explaining GDL, seat belt use and making wise choices. Can't wait for the spring class! We had a good program with a large group of students at Northridge High! Lots of good tweets were sent to our twitter contest. The winner of the random drawing was Amy Haining. 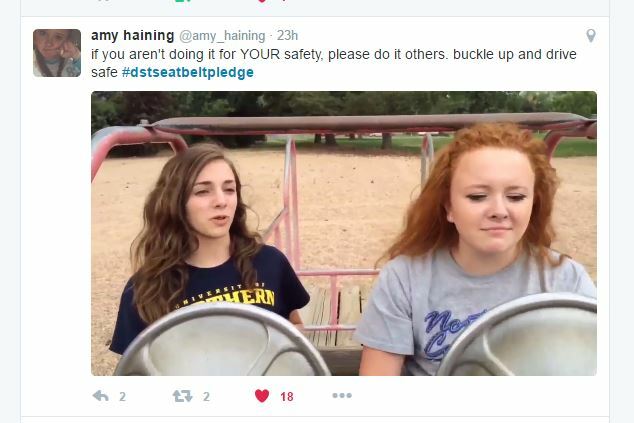 Amy posted a brief video of distracted driving. Congratulations Amy! Here are a few tweets and speaker Ron Waterman from the DST program at Weld Central yesterday. Thanks to the DST team, students and staff (Melissa Jones) for a good morning! We began the 2016 2017 school year with a program at Prairie High in New Raymer. New Raymer/Stoneham fireman were on hand to demo equipment and talk about safe driving in rural areas. There were lots of good tweets with Paige Northrup being the winner of the random drawing for a $25 gift card. 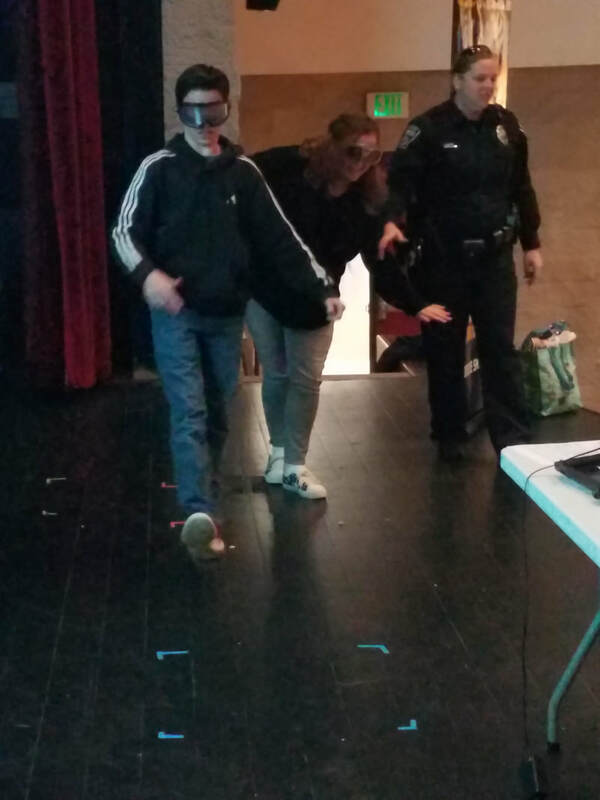 Students complete a roadside sobriety test with fatal vision goggles. ​Trying to play catch while wearing fatal vision goggles. ​Seat belt tug o war.